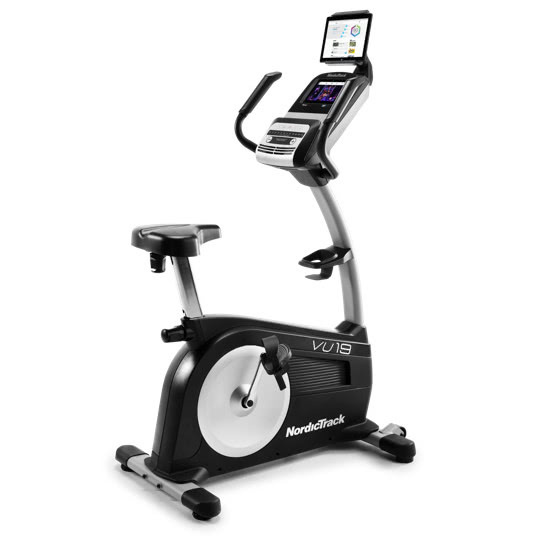 The new Commercial VU 19 replaces the previous GX 4.6 Pro, a popular upright bike from NordicTrack, the largest cardio equipment manufacturer in the world. The Commercial VU 19 has a compact frame with an oversized cushioned adjustable seat, wide adjustable pedals and a bright 7" Smart HD touch screen. According to our reviews, there's really not too much difference between the Commercial VU 19 and the GX 4.6 Pro that it replaced. The main specs are nearly identical. And that's certainly not a bad thing, because that bike had plenty to offer. It has the same 19 lb. flywheel, 24 different resistance levels and 32 built in workout programs to choose from. That's a lot of flexibility for you and you can pretty much pick a different type of workout every time you get onto the machine. The VU 19 also shares the awesome 7" color touch screen, something you don't typically find on other exercise bikes, especially in this price range. So that's a nice treat. 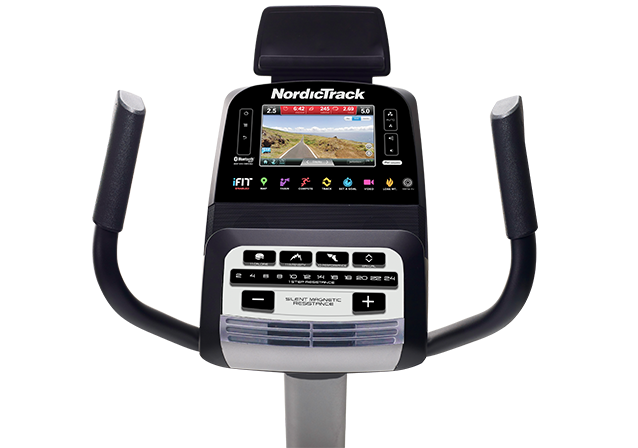 One of the best things about the touch screen, in addition to the fact that you can see all of your workout metrics in a bright, easy to read fashion, is the ability to view Google map locations of any destination worldwide via NordicTrack's iFit program. You simply choose a destination, and it's like you are there, biking outdoors along any road, path or trail you've selected. iFit also comes with all sorts of specially designed workouts as well as tracking ability so you can keep tabs on all of your results. It's a great system and really helps keep you motivated. Note that iFit does require a yearly fee, but as of the writing of this Commercial VU 19 review, you get one year free, which is a nice extra. Some other great features include a pivoting tablet holder, music port with speakers, grip and wireless heart rate monitoring for more accuracy, and a high level of adjustability in the seat as well as the pedals. The bike feels good, with a smooth, quiet motion. It's comfortable throughout your workouts, even if you're ramping it up and spending a lot of time on the bike. So are there any differences between the new VU 19 and the previous GX 4.6 Pro? Well the new bike is a little longer and sits a bit higher, but it still retains the 325 lb. max weight capacity. It also comes with that free year of iFit like we mentioned...with the previous model the membership had to be purchased separately. Also, the display has been enhanced. The previous display was a bit busier with a lot of different colored icons and more pronounced buttons. With the new NordicTrack Commercial VU 19 it seems like they are going with a more minimalist approach, with muted colors and less business on the interface, especially around the HD touch screen display. Other than this, the bike is very similar, so this seems to be just an aesthetic redesign rather than a functional improvement. As such, it remains a good choice in the price range, ofering you features and capabilities you're just not going to find elsewhere. We're definitely fans of the NordicTrack exercise bikes, as they have something for every fitness and budget level. They have uprights, recumbents and studio bikes, so you can choose the type that most interests you and there are at least 2 models to choose from. The Commercial VU 19 continues that tradition, with plenty of workouts, resistance levels and additional programming to keep your routine challenging and motivating you to reach your fitness goals. The 7" touch screen with iFit is a real bonus, taking your workouts to the next level and the ability to train worldwide via Google maps. At under $1000 on sale, this one is certainly a winner and sure to satosfy most users.